Posted 5 August 2018 & filed under 1930s, Footpaths and stiles, Margaret Brown, Places and spaces, Streets. 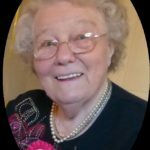 Margaret Brown, born 1928, remembers Cottonmill Lane as being a narrow lane with footpaths, how it was mainly fields, and allotments with little or no access to other roads from the lane. For example, she remembers her mother telling her that she had to get to Prospect Road through a hole in the fence as the bottom half was just fields. Hello Margaret, not sure if you remember me I used to be married to Vera Faulkner’s son Richard. I had been reading the history of St Peters school and came across your name about Cottonmill Lane. Hope you are keeping well. I now live on the north Norfolk coast by the sea and look after my farther in law who lives with us. So nice to see a face I remember. Use the Search panel if you are looking for something specific, or browse our categories and tags and pick one that looks interesting to you. If you are looking for a specific name, e.g. John Smith, or for a term with two or more words, then it is best to put double quotation marks around them, e.g. “John Smith”. Note: The search facility is not case sensitive, so it does not matter if you write a search term in upper or lower case or a mixture of both. Also, the search does not look for whole-word matches; cases where only part of a word matches your search will also be found.